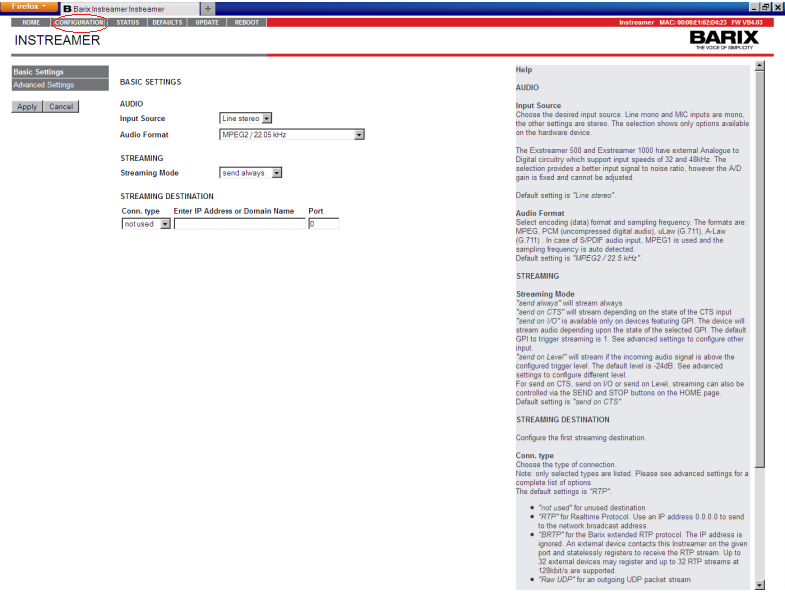 1Login to the Instreamer Interface with the provided IP address. Plug in and start the InStreamer while connecting a pair of headphones or speakers and pay attention to the series of numbers it will give you. The numbers represent the IP address to be entered in your browser's address field in order to access the web interface. The IP address format is as follows , ex: 192.168.10.10. Login to the interface with the default user and password. In order to start configuring your encoder, you must click on the "Configuration" button, on the main encoder page. While in the configuration page, select the Audio tab you want to setup, and add your preferred audio settings such as: Input source and audio format. 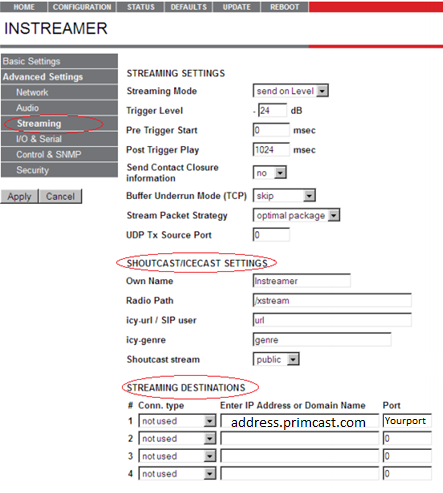 Once you're done with the basic settings, enter your Primcast server address and port number in the SREAMING DESTINATION section. You can find this information in your Primcast activation e-mail or by logging in to your Primcast account. When you're finished, click "Apply". 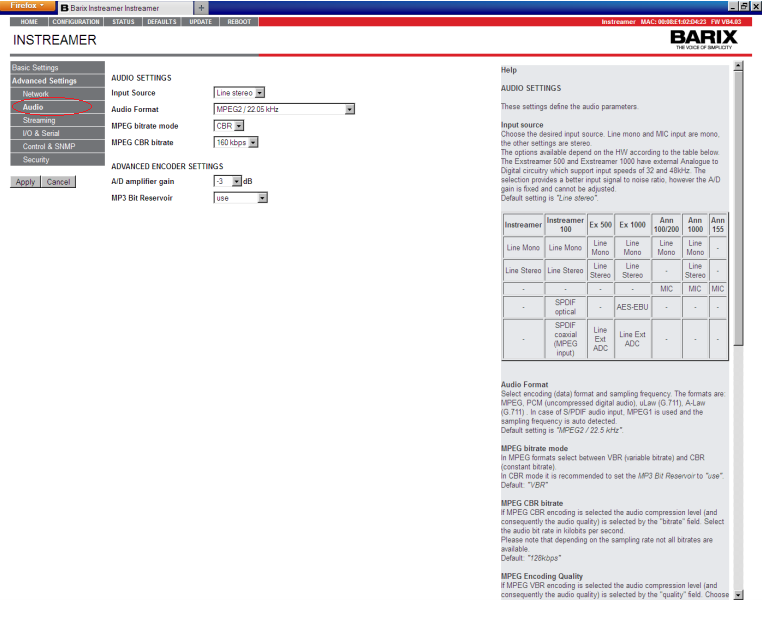 In the audio tab of your Barix Instreamer portal, you will find several audio settings that will modify the audio output of your stream, such as the input source, audio format and bitrate. You can adjust these settings to your specific requirements or leave them as they are. Note: You should choose your bitrate based on your audience. If your audience is mainly dial-up users, broadcast at 24 to 32kbps. For Cable or DSL users, broadcast at 56 to 128kbps. We normally don't recommend broadcasting at bitrates higher than 128kbps. Note: Most CD quality Audio is encoded at 128kbps. Broadcasting at a higher bitrate will only waste your allocated bandwidth. After completing the basic setup and the audio setup with your preferred settings, proceed by clicking on the "Streaming" button found on the left side of the options panel. Here you will have the possibility to configure additional streaming settings such as the name of your stream, and several streaming destinations. Type in your desired name and destinations, then click "Apply". Next, click on the "Security" tab to enter your stream password. 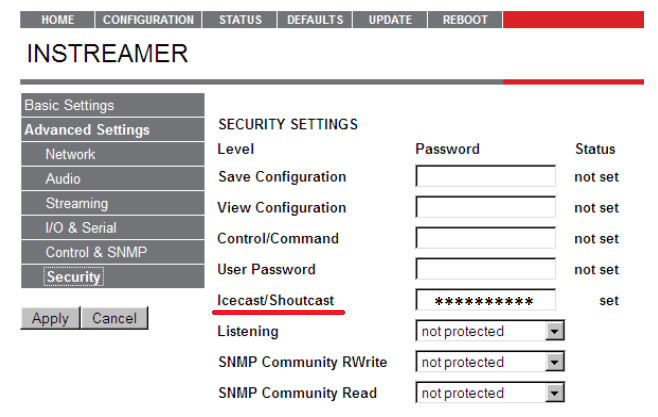 The password can be found in your Primcast activation e-mail or by logging in to your Primcast account. Click "Apply" and you're ready to start streaming.